Growing is a creative and passionate art. At Purple Reign, our objective is to provide the necessary tools and equipment to formulate each of our customer’s unique art of growing. Our hydroponic products are superior quality, affordable, up-to-date, and backed by exceptional service. We believe in yielding superior products without the higher price tag, as well as cultivating positive and strong relationships with our customers. 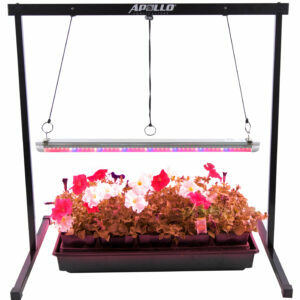 And what better way to get started than with the Purple Reign LED T8 Grow Light System. The Purple Reign LED T8 Grow Light System is an all-in-one starter set with all the necessities for your sprouting seedlings. 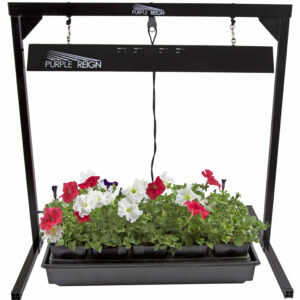 Compact and easy-to-assemble, you will spend less time setting up and more time growing. This system uses LED lights, which have a higher efficiency, generate less heat, and boast a longer lifespan – Better for your plants and better for your electricity bill. We strive to be the guiding light for our customers in the world of hydroponics, and not only grow with them through the years, but help them truly flourish.